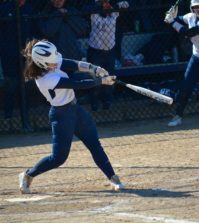 The Quinnipiac softball team continued to climb the standings in the Northeast Conference Friday by splitting a doubleheader with Sacred Heart to move into second place. The Bobcats shut out the Pioneers in the first game 2-0 behind pitcher Heather Schwartzburg’s complete game three-hit shutout. Schwartzburg’s record improved to 17-9 as she struck out seven batters, including the final batter of the game which represented the tying run. 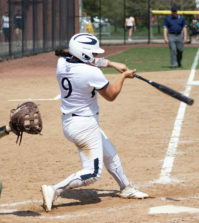 Quinnipiac’s offense jumped on the board in the fifth inning when Mina Duffy led off with a walk and Lauren Salgado singled to the shortstop driving in Julie Sini, who was pinch-running for Duffy. The Bobcats added an insurance run in the top of the sixth. Jacqueline Ristow and Jordan Paolucci reached base on back-to-back singles, setting up Bridget Figmic’s RBI single to center-field to give the Bobcats a 2-0 lead. In the second game, Sacred Heart jumped out to a quick 3-0 lead in the first inning and never looked back. Pioneer pitcher Jen Russell tossed a complete game one-hit shutout against the Bobcats to lead the Pioneers to an 8-0 victory. QU’s only hit came in the fourth inning when Ristow singled to left field. Russell struck out one batter in her 13th win of the season while Duffy took the loss for the Bobcats, allowing seven earned runs in 4.1 innings off three hits and six walks. Katie Alfiere came in to relieve Duffy and allowed the final run of the game. The Bobcats’s doubleheader against Farleigh Dickinson Saturday was postponed and took place yesterday at 3 p.m. at the Quinnipiac Softball Field. They will face Stony Brook today in a non-conference matchup.